Interpretation Act:By the provision of S. 32 of the Interpretation Act, the common law of England, the doctrines of equity and statutes of general application that were in force on 1st January 1900, will be in force in Nigeria. Subject to the terms of this or any other ordinance, the rules of common law, doctrines of equity and Statutes of General Application In force on January 1st 1900 shall be in force in the jurisdiction of this court. From the above, it can be seen that we inherited the common law of England, the doctrines of equity and statutes of general application in force before 1900. Most people already have an idea of what common law and equity are all about (If you don’t, see types and classifications of law). The ambiguous term here is “statutes of general application. This meaning of this term would be explained below. What is a Statute of General Application? According to the Interpretation Act and the Supreme Court ordinance, statutes of general applications are those that are in force in England on 1st January 1900. Unfortunately, this definition is not adequate. Due to this, the courts have gone at length to elucidate on what Statutes of General Application entail. In the case of Dede vs African Association ltd, the court held that although the Supreme Court ordinance identified that Statutes of General Application are applied in England, nevertheless, it should be taken to mean statutes applicable not just in England but throughout the United Kingdom. In the case of Attorney General vs. John Holt and co ltd, Osborne CJ. Held that Statutes of General Application are statutes that are applied by all civil and criminal courts and bind all citizens. He called this a rough but not infallible test for the authenticity of a Statute of General Application. In the case of Lawal vs Younan, the court decided that the Fatal Accident Act of 1846 and the Fatal Accident Act of 1864 are statutes of general application since they concern all citizens. Finally, in the case of Young vs Abina, the West African court of appeal declared the land transfer act 1897 a statute of general application. This is because it applied to all persons who died after 1st January 1898 and it was in force on 1st January 1900. It is worthy to note that Nigeria having got independence in 1960, the received English law is only of persuasive authority in view of the fact that Nigeria is now a sovereign state and as such, Nigerian law is supreme. Nigeria shall not be governed by any other person except in accordance with the provisions of the constitution. Also, the interpretation Act provides in S. 32(2) that these foreign laws would only apply in Nigeria to the extent of local jurisdictions and local circumstances. For instance, the supreme court in the case of Idehen vs idehen refused to apply the Wills Act of 1837 (a statute of general application) since there was a local law in place; the Wills Law of Western Nigeria. Also, in the case of Alli vs Okulaja, the plaintiff sued the defendant for damages as a result of injuries caused by the defendant’s negligence. The defendant moved a motion that proceedings should be stayed until the plaintiff is examined by their doctor. The defendant relied on the English court of appeal case of Edmeads vs Thames Board mills ltd where the judge allowed the defendant to examine the plaintiff. Beckley J, however ruled that a decision of the court of appeal in England is not binding on a Nigerian court. It is at best persuasive. It is an interesting law study research work, with professional expertise. Pls I was researching for my assignment and got stuck. The issue of whether an English statute is one of general application to be applied in Nigeria is uncertain and controversial. Discuss. Thanx for ur help. What part of the section are you not clear on? Very Helpful article Sir. I have a question: Have the legislature enacted any laws that override the Sale of Goods Act, 1893 in the aspect of trade or rather commercial law. In Western states, there is a Sales of goods law which was enacted by the state legislature. But in other parts of Nigeria where there isn’t a local Sales of Goods Law, the Sales of Goods Act still applies since it is a statute of general application. 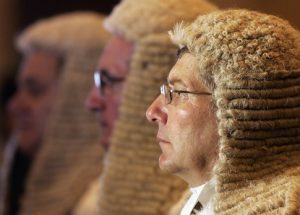 Although Nigeria is independent, the English Legal System has a huge role to play. For instance, S. 32 of the interpretation makes common law, Equity and statutes of general application applicable in Nigeria. Also, if you look at the law courts, the English Common law has a large influence. Even the doctrine of Judicial precedence is a testimony to the influence of English Law. PLEASE CAN YOU LIST AT LEAST FIVE STATUTES OF GENERAL APPLICATION FOR ME? Please i have an assignment here i dont know how to go about it, ‘Land tenure sytem under the received english law’i would be happy if you can help. Good day. I’ll probably do that in a future post, as it would be impossible to do all that in a comment. Good day Sir … isn’t Recieved english law more of a primary authority rather than a persuasive one? why are statutes of general of application associated with the date 1st Jan 1900… is there anything significant or noteworthy about the date? That was a new year. The dawn of a new century — the 20th century. Post the required provision of the law so that I can peruse it. Better still, you can subscribe to my mailing list so that you can send me a mail whenever you need something. Sir I have a question in an assignment. Determining the actual content of the received English law is like going through a maze. Discuss?